CHRISTMAS CRAFTS TO MAKE THIS WEEK END. It's the last week end before Christmas, so I thought I'd share a few last minute crafts that can be made over the next few days. 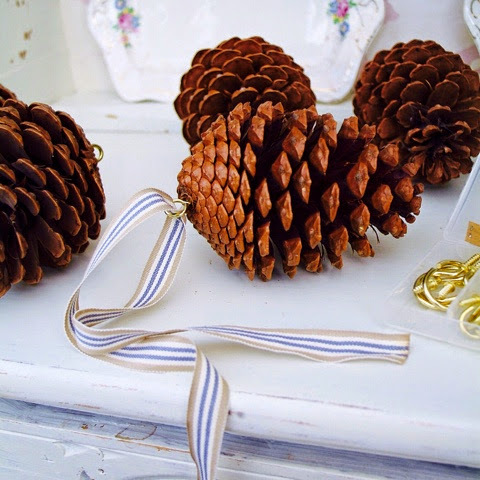 Hanging pine cones. Difficulty: easy. Time: 2 minutes per cone. You will need pine cones, brass eye screws and ribbon. Simply screw the brass eyes into the base of the cone and thread with ribbon. Stockings. Difficulty: experience with a sewing machine helpfull. Time: 15 to 30 minutes. You will need to make a template using a large sheet of paper/card. You will also need material, pins, scissors and a sewing machine. Draw a stocking shape on a piece of card, make sure it is a little larger than the size stocking you would like as you need to allow for the seam. Double over your fabric then tack your stencil on with pins, keeping it flat cut around the template so you have two matching pieces. Run a one centimetre hem at the top of each. Sew together with the hems facing outward, following the shape with a 1cm allowance. Turn the right way. You now have a basic stocking that can be customised with lace/pretty fabric, buttons and brooches. 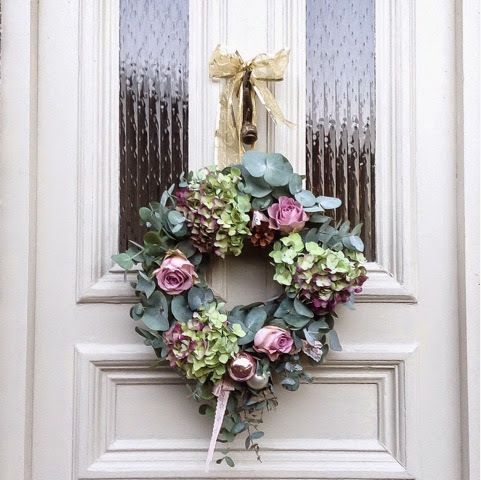 Dry wreath. Difficulty: easy. Time: 5 mins. 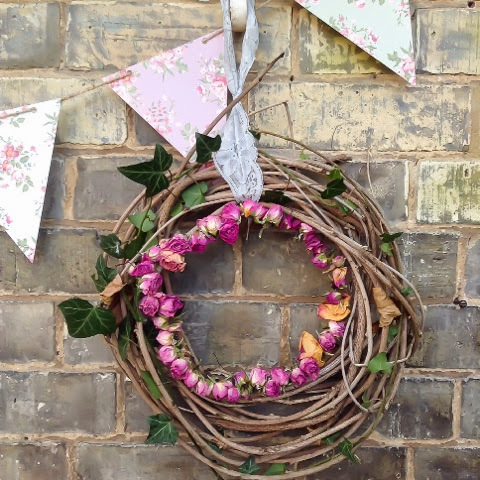 You will need a willow wreath, ivy, dried flowers, needle and thread and floristry wire. Thread dried flowers together using a needle and cotton. Simply wrap ivy around tucking in stems and securing with wire. Attach dried blooms with wire and add a ribbon for hanging. Fresh wreath. Difficulty: medium. Time 30 mins (plus 1hr soaking). You will need an oasis ring (soaked in water for an hour), ribbon for hanging, good foliage such as holly or eucalyptus. 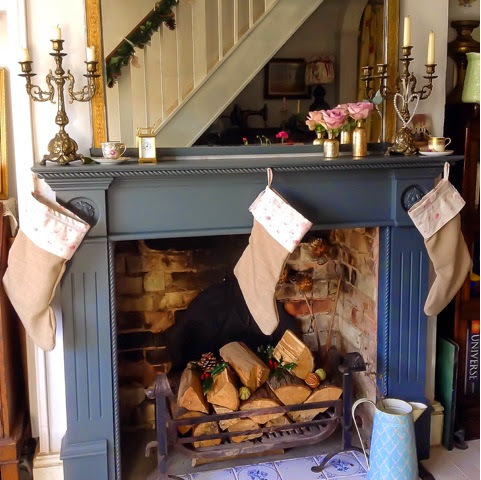 Blooms, secateurs, florist wire and any pretty decorations. The full tutorial is on the blog in the Creative Corner (right of page). Gift tags. Difficulty: easy. Time: 5 mins. 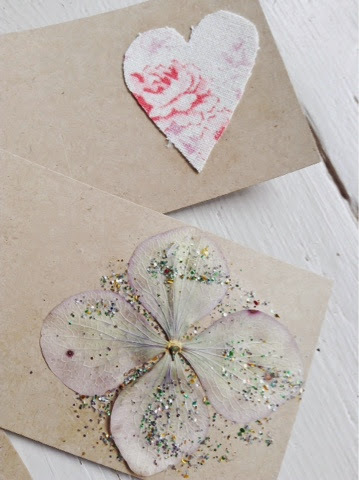 You will need luggage tags, glue, fabric scraps, dried petals and glitter. Simply glue and stick fabric shapes and petals. So pretty, so simple. Burlap bows. Difficulty: easy. Time: 5 mins. You will need burlap, scissors, lace, floristry wire and glitter. 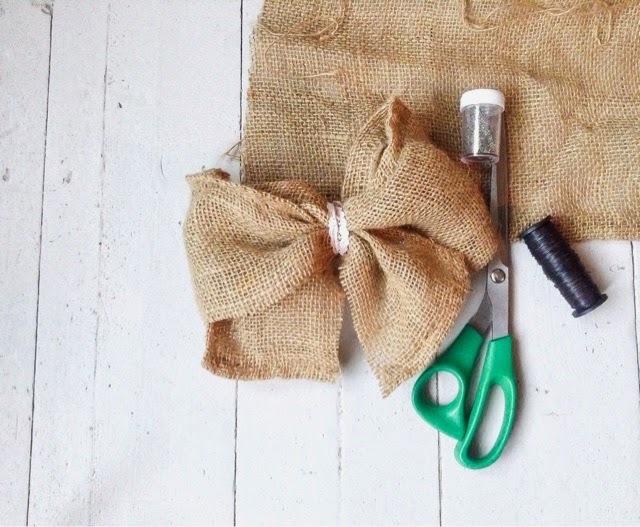 Cut a long strip of burlap and then bring the ends into the middle, pinch in the middle and adjust the ends by pulling into a bow shape. Secure around the middle with wire then wrap ribbon or lace around to hide the wire. Sprinkle with glitter. Fabric decorations. Difficulty: basic sewing skills needed. Time 15 mins per decoration. You will need templates of different shapes, pretty fabric, scissors, sewing machine (you can hand sew also) and pretty buttons, filling. Double the fabric and secure the template with pins, cut around. Place the pieces together right way round. Carefully sew together leaving a 1cm gap to fill with stuffing. 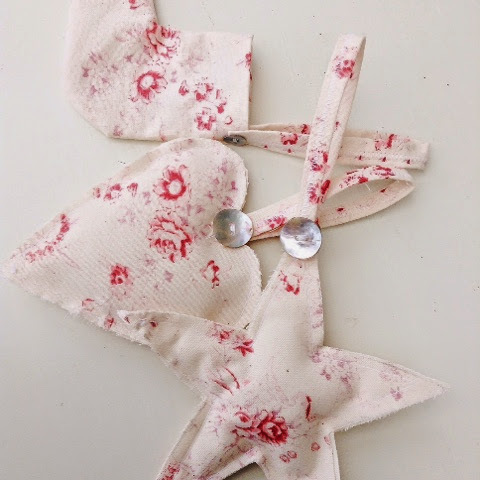 Sew up gap and attach ribbon for hanging, finish with pretty buttons. 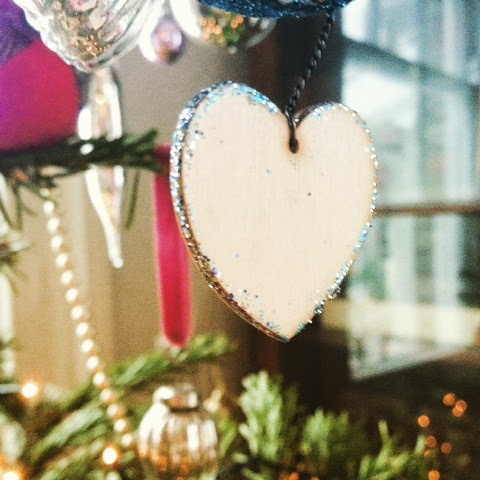 Glittery wooden hearts. Difficulty: easy. Time: 1 minute. You will need wooden hearts (from craft supplies), glue, glitter, ribbon or wire. Apply glue to the rim of the heart and sprinkle with glitter, add a ribbon and pop on the tree. Have a lovely week end everyone.